ENTER THE WORLD FINAL NOW! The Host Hotel, the Hyatt Regency Downtown Miami, is connected to the James L knight Centre so ideal for athletes as there is no travelling for check-in, tanning, hair, make up or the event. The DFAC Check in Desk will be in the Hotel Foyer From the Thurs 24th until Late Fri 25th Oct. You will register there for check in, polygraphs and to buy tickets. You will also be able to ask any questions leading up to the event. The Hotel provides fridges in the rooms on request and also microwave stations in the foyer. These have become social hubs where athletes seem to gather chat and get to know each other. Some groups also buy Foreman Grills and air fryers for the rooms . The hotel really does become a great hub for everyone and creates a very social atmosphere with everyone be able to relax in the large foyer area. It’s ideally situated with Wholefoods literally across the road where you can get anything you need. In addition if you prefer there is a Publics supermarket 10 mins away on the free Miami Metro mover the station is just outside the hotel. Check out the area here. 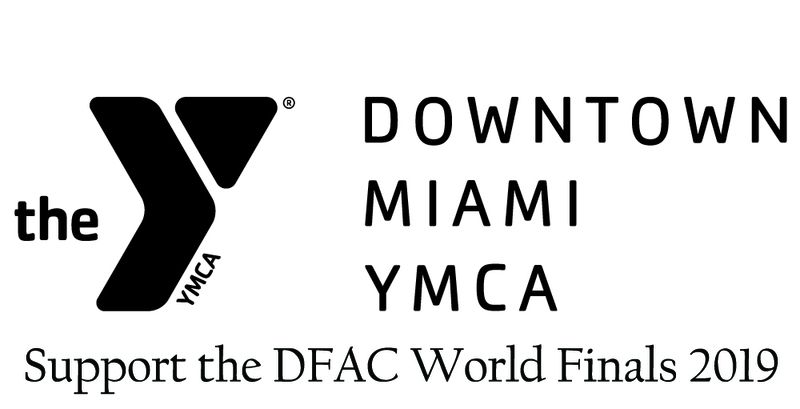 In addition over the DFAC World Finals Event athletes will have use of the impressive Downtown Miami YMCA which is 2 block away from the host hotel approx a 5 min walk. After the show we have a venue booked where you can eat drink and socialize until the early hours or until exhausted. This will again be within 5 mins walk from hotel. The following day we have a pool party at North Maimi which is approx 20 mins away the best way to get there is by Uber it is a great venue a sports bar with DJ music dancing a poool and great food and drink at great prices no tourist rates here. It was recommended and music played by friend of the DFAC DJ Thomas Dozier. Checkout their facebook page here. The weekend is based around a very competitive Pro and Amateur natural competition but is a great social weekend where lifelong friendships are made with athletes from all round the world. The Emphasis is on bringing the best natural competitors from all round the world to compete for a genuine world title with the best drug testing available using WADA Acredited Lab and strict protocol. Transparent judging and stages that are 2nd to none for lighting. The DFAC is a Coalition so welcomes Athletes from every natural organization to test themselves against the best in the World. The venue is in downtown Miami which is a 15- 20 min drive to South Beach so easy to visit Miami beach. Again, Uber seems to be most cost effective way to get there – buses are available and very cheap but take a little longer. If you have any further questions use the contact us link to ask anything. Make sure you do not miss out – Register Now! The YMCA Miami is 2 blocks from the Host hotel – about 5 minute walk. They welcome the DFAC competitors the World final weekend.